kills three in South Korea. 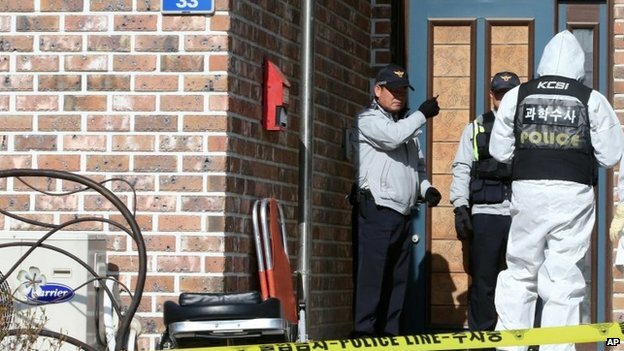 A gunman has killed three people and then himself at an apartment in the South Korean city of Hwaseong, reports say. An elderly couple were among the dead, and the gunman was the brother of the husband, the reports said. A local policeman who reportedly was the first to respond to a call for help was also killed. The shooting, just south of Seoul, comes just days after a similar incident in Sejong city on Tuesday. Three people were killed there when a gunman opened fire at a convenience store. The gunman - who was later found dead - was the ex-boyfriend of one of the victims' sister. Reports said the dead couple in Hwaseong were in their eighties. Their daughter-in-law escaped by jumping out of a window to alert police, reports said. Gun crime is extremely rare in South Korea. Most men have experience using a firearm because of compulsory military service but private gun ownership is banned. Only security personnel can carry guns, and hunters must keep their firearms at a police station. In both recent shooting cases, however, the gunmen were reported to have retrieved shotguns from police stations just before carrying out their attacks.